The story of Joyce Vincent (played by Zawe Ashton in re-enactments) — a woman who died alone in her North London bedsit just before Christmas 2003 and lay undiscovered until January 2006 — forms the devastatingly moving basis of Carol Morley’s superb documentary. Fascinated by the story, Ms. Morley’s investigative determination to unravel the mystery and get to the bottom of how Joyce could seemingly slip so readily through the cracks of society actually ends up being so much more than a quest for answers. Melding firsthand, talking-head accounts of the people Joyce encountered over the years with dramatic reconstructions of her living her life in ’80s London, Morley ends up celebrating Joyce’s life, providing a fitting epitaph and a reminder that behind the headlines is a real person who doesn’t deserve to be forgotten in such a way. Apparent friends recount how when they heard the news about the circumstances of Joyce’s death, they couldn’t fathom how she could meet such an end. To them, she was a vibrant, popular woman who had everything going for her. To an extent, they absolve themselves of any blame, and it quickly becomes quite daunting to realize how easy it was for Joyce to disappear without a trace. The main player is her ex-boyfriend Martin Lister, a gentle, kindly man who talks fondly of Joyce and the time they spent together. He dwells on aspects of Joyce’s looks and personality and paints a very tangible picture of the kind of person she was. It’s touching, even heartbreaking at times, as he evidently holds her in high regard. Morley intersperses these reminisces with recreations of Joyce’s final moments, and the ensuing forensic examination of her dusty flat, eerily stuck in December 2003 like some sort of time capsule, Christmas presents wrapped up and the television still blaring. It soon transpires that no one really knew Joyce, and her friends were more often than not fleeting acquaintances with whom she soon lost touch as she moved on. Although magnetic, friendly and personable, it is clear that Joyce maintained an outward persona, never letting anyone get to know her real self. Her familial history is hinted at but never fully explored, although it’s obvious that her mother’s untimely death and a rift with her father did much to distance her from her siblings. Joyce ultimately lived a transient life; living in the moment, adapting to her surroundings like a chameleon and maintaining few anchors, save for Martin. It’s particularly telling when another ex-boyfriend, Alistair Abrahams, utters the words: “Joyce wasn’t a person with a past, and she wasn’t a person with a future.” And the blame for her fate is somewhat placed at her own feet. While her life in the ’80s is fully documented, there are more glaring gaps throughout the ’90s. It is suggested an abusive relationships finally led her to her Wood Green bedsit; but details are sketchy, and it’s clear that Ms. Morley hit more than a few brick walls along the way. But it all makes for a fascinating story that — despite the inherently sad subject matter — is tonally light at times and comes across as a real celebration of Joyce’s life. What’s more, it holds a somewhat uncomfortable mirror up to our disconnected and increasingly disparate society. Here was a woman who literally vanished and nobody noticed for over two years, the galling reality of the desperate situation Joyce eventually found herself in too dreadful to imagine. If for nothing else, Ms. Morley’s brave, emotive, relevant and timely piece of work should be hailed for forcing us all to take a long look at the state of our disintegrating sense of community. 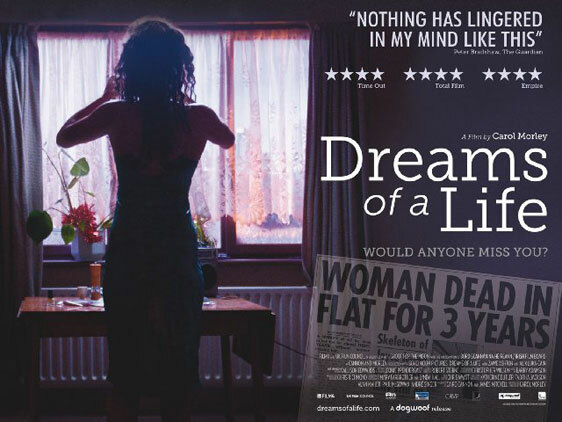 Few films possess the power to be a force for change, but “Dreams of a Life” is one of them.